The Cowboy is a double album – coming soon (along with fancy credits and notes here on this page). 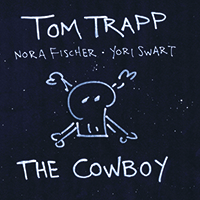 As you can see from the cover, Nora Fischer and Yori Swart both sing on the album, and that’s pretty fantastic. All I’ll say now is that it’s a concept album about a Cowboy and his women. Designed with a theatrical concert in mind. Mark Haanstra plays bass and Joost Kroon plays drums too. Exciting!